Oceanfront Condominium with Incredible Views! 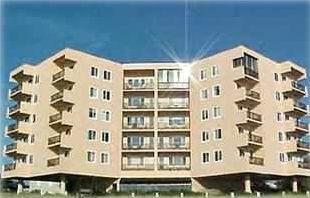 The 'SeaWatch' is a modern 40 unit condominium building, with security controlled entrance, centrally located on Maine's most beautiful seven mile stretch of white sandy shore in Old Orchard Beach. This unit is an Oceanfront, two bedroom, two bath condo, with oceanfront balcony, located directly on this premier sandy beach. Centrally located to all South Coast attractions. Enjoy amazing sunrises and panoramic ocean views from your balcony, living room, and dining area. Capture spectacular sunsets on the beach. Relax, read or fall asleep to the soothing sounds of the oceans waves. Enjoy long peaceful walks on the sand, refreshing swims in the ocean, or unwind in the heated indoor pool. Walk to the famous and historic Old Orchard Beach Pier, Amusement Park, arcades, pubs, restaurants, gift shops, live concerts, and churches. Enjoy the entertainment with fireworks (in season) every Thursday evening. Be a kid again and join in the excitement! This is a picture, taken a few years back at the 'Cabbage Island Clambake' out of Boothbay Harbor, Maine. If you have never experienced this classic Maine clambake, we would absolutely recommend it. My wife and I are retired educators with Ann spending 35 years teaching Art at Fitchburg High School and me spending 35 years teaching Science at the Shirley Middle School. In our retirement we have opened a small art gallery in our hometown. Ever since we were kids our families spent summers at the ocean. We grew to love the beach and enjoy spending time there tremendously. Sharing our home with our guests is something Ann and I really enjoy doing, and some of our guests have become friends that enjoy our little 'home away from home' as much as we do. There is nothing more relaxing, as far as I'm concerned, than sitting on the balcony with a cold drink, and watching the ocean, I can do it for hours. Because you are right 'on the beach' you don't have to walk, drive, or wait to get there..............your already there! Just relax, sit back and enjoy! An oceanfront, romantic, quiet, and private get-away. Over the years we have grown to absolutely love the off-season. Some of our favorite times in OOB are the early Spring and Fall as things are peaceful, calm, and relaxing. The bedroom and bath locations are ideal for two couples sharing the condo. Each couple will have a private bedroom and full private bath. Both baths have hair dryers. This condo is direct beachfront.......can't get any closer!! Ocean views from every room, including the two bedrooms. This condo is direct oceanfront with oceanfront balcony. Sit in the living room, dinning room, or on the balcony and watch all the activity on the beach. There is reserved, private, on-site parking on the SeaWatch property for two vehicles. Metered on-street parking is available for additional guests if needed. .
Hi speed internet, WIFI with your own secure password. Oceanfront balcony. Sit in the shade every day after 10:00AM and watch the entire beach directly in front of you. Have your morning coffee on the balcony while you watch all the activity. Marsh, river, and ocean access close by. Outside bike rack to store and lock bikes. From the parking lot, to the lobby, to the elevator, and into the condo is all level, no stairs. Easily accessible for guests using a wheelchair. Indoor heated pool is great for the kids in case of a rainy day. Indoor tables and chairs to relax by the pool. I have been visiting OOB for nearly 25 years and.have always stayed at a few select oceanfront condos. It just so happened that these rentals were not available this winter visit so I frantically searched for a new, clean, quiet place for my family. I was extremely fortunate to find Pete's listing online. After a VERY quick transaction and excellent communication with Pete...I was able to check in to this very beautiful condo unit. I was very impressed with the beachy decor and clean premises. The ocean view and skyline are amazing and more importantly the unit and building were peacefully serene and quiet. I will definitely be booking this unit again! A special thanks to Pete for making this quick booking so easy! We stayed at the Seawatch from June 3rd to June 10th 2017. The publicity included an indoor swimming pool.. we were not informed that the pool was closed and had been for a little while. We paid for a week un a condo with an indoor swimming pool and that was what we were expecting to have. If we had known we would have rented somewhere else. The owner called us on Monday to advise us that the pool would be repaired on Tuesday but it was not. We are very unsatisfied with the rental and we think it was not worth the price we paid for. We really took this reservation because there was a indoor pool and we did not get what we paid for. This is a very unfair review of our vacation property. Our condo is one of 40 units in this complex and we have a shared indoor pool. I have absolutely no control over what happens to the pool, how it is operated, or how it is maintained, it is totally controlled by a management agency. Because of a couple of unfortunate circumstances, i.e. waiting for a part for the pump to arrive and secondly the shattering of a piece of glass in the pool atrium that scattered glass fragments all over the bottom of the pool, the management agency determined it was necessary to close the pool for a short period of time. When all issues were taken care of and the pool was safe to use again, it was reopened. Please note that this guest had no complaints about the accommodations, only the pool. I’ll trust that you will take into account our 48 “5 Star Reviews” and 3 “4 Star Reviews” when making your vacation plans. The location of this condo on the beachfront is perfect. Only steps away from the Pier and miles of walkable beachfront. The cost for the location is what gives this unit its 4 star rating. The condo itself is very good though the carpet in the bedrooms is stained and the bedroom walls could use painting. There is no WiFi in the unit which was very disappointing in this day and age. Take DVDs and perhaps board games for rainy days as those are not supplied. Otherwise everything we needed was there. The owner was very responsive and helpful. The review loses 1 star for the condition of the building property which is outdated and a bit shabby. There was no outdoor area to rinse off from the beach. There was also construction going on during our stay (roof being replaced and the glass wall in the pool area being replaced...lots of noise from that repair abd pool was not available during our stay). This year marks the 4th or 5th time we've been a guest of Pete and Ann. The condo is fully appointed with everything you might need and is mere steps from the sand and surf. It was immaculate upon arrival. The ocean is mere steps away and can be enjoyed from the balcony at anytime, day or night. The sounds of the waves are soothing and relaxing and just what a vacation should be all about! There are many shops and restaurants within walking distance. Try Big Daddy's for burgers, The Landmark for upscale dining and Rising Tide for a no nonsense, casual lobster fix! The only bad day is the day we depart this wonderful oasis of sun, sand, surf and lobster. We LOVE this place! It's all about the beach! The condo is front and center for all that OOB has to offer. The view is amazing--looking north along the beach. Peter and Ann have decorated in an attractive "coastal" theme--and it sets the tone for a relaxing seaside vacation. Both bedrooms had loads of storage, and very comfy beds, as well as individual heat controls which was great as my Mom likes her room "warm and cozy." The kitchen was extremely well outfitted. I like to cook and bake and it was so easy with all they have available. Above all though, the condo was immaculate. I am very picky and so appreciated their attention to cleanliness. There is an indoor pool if weather is inclement, but there is also the PERFECT walking beach just steps away for daily exercise or relaxation. The Pier is within walking distance, but although we were there off season imagine it is just the right distance away to insure a more quiet and restful vacation even in the middle of summer. The elevator access as well as the "luggage cart" that Pete and Ann have in their unit which "hauled" a lot of stuff made move-in and out a breeze. If this condo fits your # of guests I can't imagine there is a better condo in all of OOB than this one. We recently spent a week at Peter and Ann's condo in Old Orchard Beach from Oct 3 to 11, 2015. The condo was very comfortable for the four of us. Decor very beach like and the view right on the ocean is amazing. We cooked in most of the time and everything we needed was available.. We even cooked lobsters one evening. We did have a medical emergency one night and the first responders were quick to arrive, they were very efficient and transported my brother in law to hospital in Portland quickly. The care he received was amazing and his outcome was good. Peter very kindly let us have an extra night at the condo before we headed home. We did go out one night to " The Rising Tide". Not fancy but the food was wonderful ( lobster ). Enjoyed travelling along Highway 1 and 9 driving through Kennebunkport, Ogunquit, Biddeford Pool to name a few small towns. The colours of trees was beautiful at this time as well. Very quiet this time of year but that is our preference. All in all a good vacation. Rentals are generally Saturday to Saturday. Please don't hesitate to call me with special requests as I'll be happy to help. Refund Policy: The rental amount is refundable up to 90 days prior to the rental period. After 90 days prior to the rental period the landlord shall have the right to retain any monies collected. Only if the property can be re-rented for the same period, and at the same rate, will the landlord consider a refund. Travel insurance is inexpensive and encouraged. There is a non-refundable reservation/bookkeeping fee of $250 on all cancelled reservations.